Gourmet Carrot Cake is rated 4.9 out of 5 by 8. Rated 5 out of 5 by compusaurus from We bought 2 cakes and a cheesecake all were great! We got a Red Velvet, Carrot Cake and Creme Brulee Cheescake and everybody who had some said they were great! Very pleased with our purchase and also great service; everything was delivered on time and perfect condition. Rated 5 out of 5 by wired weasel from Delicious!!! This was the highlight of a fantastic Thanksgiving Dinner. This was the best carrot cake that I have ever had and the icing was to die for. Fantastic! Rated 5 out of 5 by Very cherry from Delicious and beautiful Sent a carrot cake to Texas for my Dad's birthday. It arrived on the day I choose and was beautiful. My Dad said it was the best carrot cake he had ever had. Rated 5 out of 5 by RoberM from Now THIS is a Carrot Cake! I bought this as a thank you gift for my very helpful neighbors. I did the same last year, and they loved it. Rated 5 out of 5 by Sandi B from Delicious..!!! I have purchased cakes for several birthdays from several companies. When they arrived, they were falling apart, EXCEPT from Gourmet Gifts. The carrot cake arrived in one piece and in tact. Not to mention it was delicious..!! I will definitely order from them again..!!! Rated 5 out of 5 by Melm28 from Carrot cake a success I had the carrot cake delivered to my son at college as it was his birthday. He and his friends thoroughly enjoyed the cake - thank you! Carrot Cake never goes out of style and one bite will tell you why. 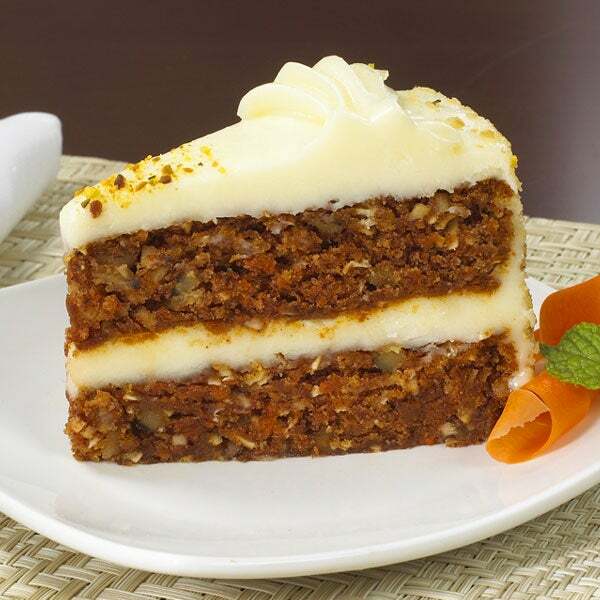 Even those who don't consider themselves carrot cake aficionados will take delight in this gourmet carrot dessert. 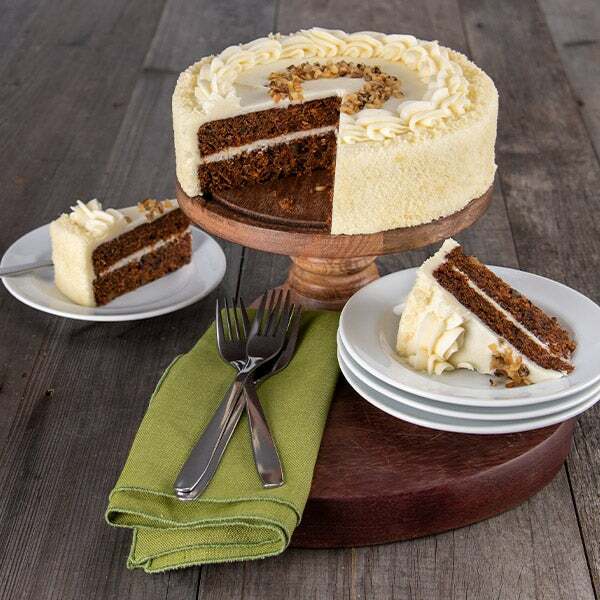 This rich 14 piece cake is spiced to perfection and topped in a decadent cream cheese frosting with a bit of tang that complements it perfectly, a popular choice in our collection of baked goods. Special Shipping Information: Our cakes are baked fresh and rushed via express shipping anywhere in the country. We pass our full shipping discount onto you to keep these express prices ridiculously low! To maintain our famous quality, cakes can only be in transit a maximum of two days.